Oct. 30, 2018, 10 a.m.
By Laura Hazard Owen @laurahazardowen Oct. 30, 2018, 10 a.m.
Western Europeans under 30 are also particularly critical of the way that the news media covers immigration, the economy, and crime. The researchers surveyed 16,114 adults across Denmark, France, the U.K., Sweden, Spain, the Netherlands, Italy, and Germany. Here are some of the findings from the report, released Tuesday. Though young people are less likely than older people to read print news, they do rely on and trust newspaper brands. Perhaps relatedly, the Reuters Institute for the Study of Journalism noted earlier this year that, across 37 countries, people under 45 are more likely to pay for news than people over 45. 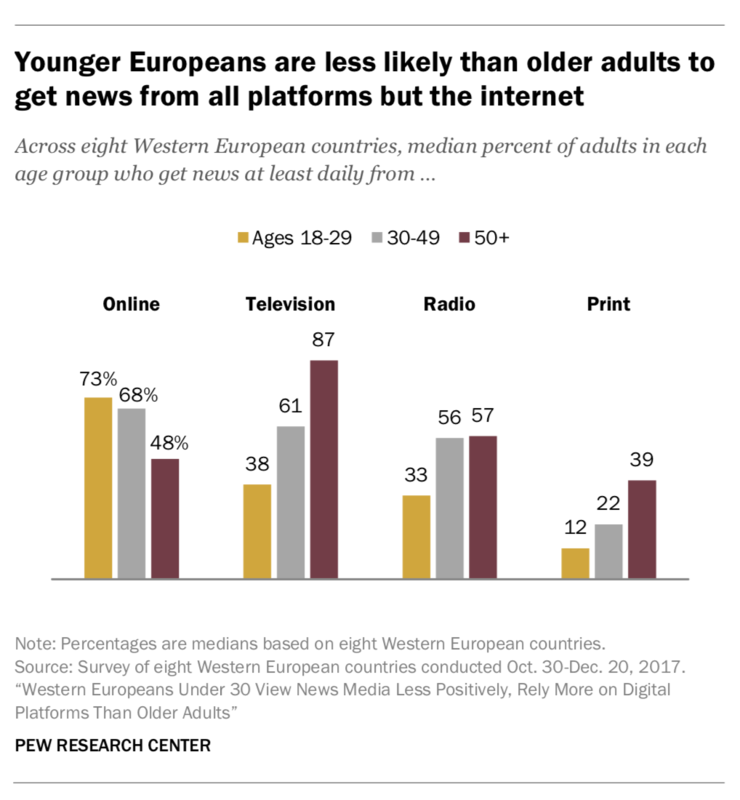 Younger Western Europeans are less likely to rely on public news organizations than older people. 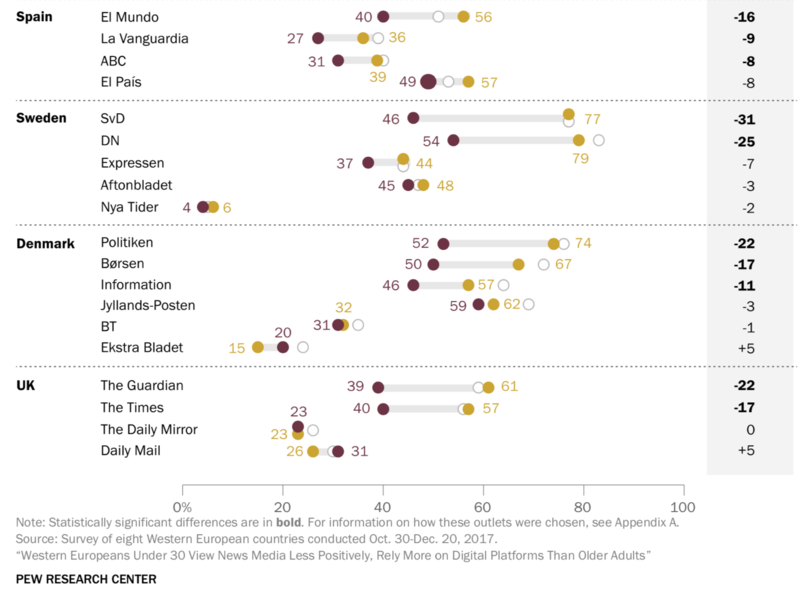 In the southern countries studied — France, Italy, and Spain — public news media don’t rank among the top three sources named by younger adults at all…In the rest of the countries surveyed, even though public news organizations do rank among their top three main sources, younger adults don’t name these accounts as frequently as those 50 and older do. A turn away from public media does not mean a turn away from traditional media companies in general. [Younger Europeans] are more likely to name a newspaper or magazine brand as their main source for news. 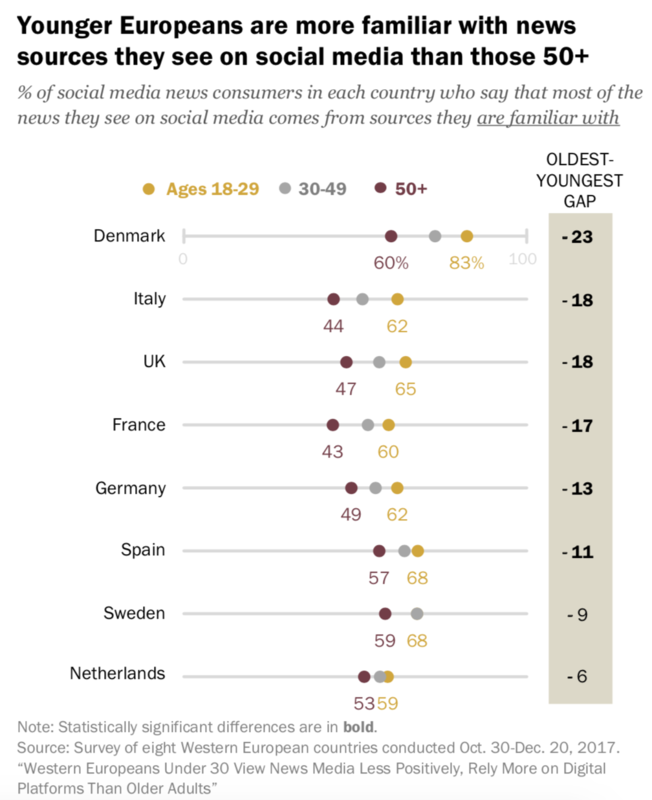 A striking example is France, where Le Monde is the most commonly named main news source among those under 30 — 20 percent name it, compared with 6 percent of those 30 to 49 and just 2 percent of those 50 and older. Newspapers are far less common as a primary news source among the oldest age group in all eight countries. Only in one country — Sweden — did adults ages 50 and older name a newspaper (Aftonbladet) at a rate of 5 percent or more as one of their primary news sources. Adults ages 30 to 49 name newspapers as main sources in some countries but usually at lower rates than those under 30. 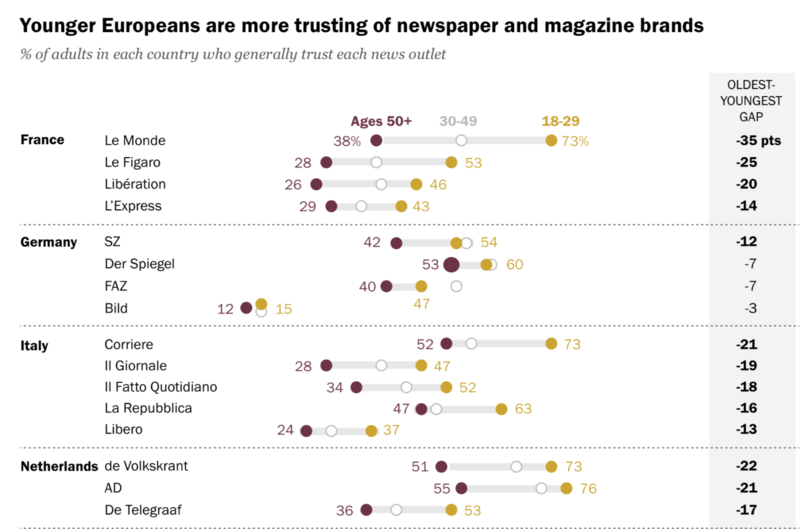 In addition, while younger Europeans trust the news media (in general) less than older adults, they trust print outlets at higher rates than older adults. POSTED Oct. 30, 2018, 10 a.m.
Owen, Laura Hazard. "Younger Europeans are tuning out of TV news — but they’re into newspaper websites." Nieman Journalism Lab. Nieman Foundation for Journalism at Harvard, 30 Oct. 2018. Web. 20 Apr. 2019. Owen, Laura Hazard. 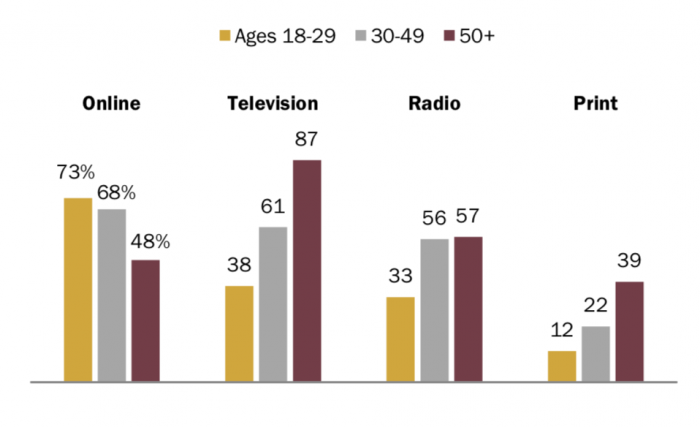 "Younger Europeans are tuning out of TV news — but they’re into newspaper websites." Nieman Journalism Lab. Last modified October 30, 2018. Accessed April 20, 2019. https://www.niemanlab.org/2018/10/younger-europeans-are-tuning-out-of-tv-news-but-theyre-into-newspaper-websites/.